"Fusion" redirects here. For the card named "Fusion" in the OCG, see "Polymerization". For the archetype, see Fusion (archetype). For other uses, see Fusion (disambiguation). Fusion Monsters (Japanese: 融（ゆう）合（ごう）モンスター Yūgō Monsutā) are a type of Monster Card. The color of their card frame is violet. These cards are placed in the Extra Deck. To be properly Special Summoned, Fusion Monsters must first be Fusion Summoned (unless otherwise specified). If they leave the Extra Deck without being properly Special Summoned, they cannot be Special Summoned while they are banished or in the Graveyard. 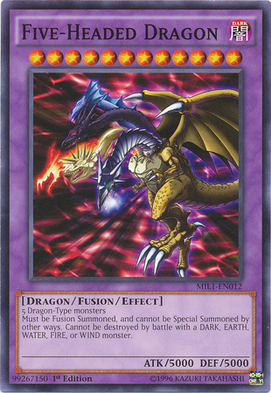 Most Fusion Monsters have a set of Fusion Materials, which are listed on the first line of the card's text. These are the materials used to perform the Summon of that monster. Like other Extra Deck monsters, Fusion Monsters cannot exist in the hand or Main Deck (even with card effects). If a Fusion Monster would be moved to the hand or Main Deck, it is returned to the Extra Deck instead. If a card like "Transmigration Break" or "Degenerate Circuit" is applying, this will override the Fusion Monster's ability to return to the Extra Deck. Originally, the only way to properly summon a Fusion Monster was through a Fusion Summon involving the required Fusion Materials and the Spell Card "Polymerization". There are now many different ways to Fusion Summon a monster and many different cards that allows the player to Fusion Summon. In Yu-Gi-Oh! 5D's and Yu-Gi-Oh! ZEXAL, Fusion Monsters were seen rarely, seemingly being replaced by Synchro and Xyz Monsters in those respective series. With Duel Terminal - Pulse of the Trishula! !, Fusion Monsters started to come back, starting with "Naturia Exterio". In Duelist Revolution, Starstrike Blast and The New Challengers, 5 more Fusion Monsters were added: "Ultimate Axon Kicker", "Dragon Knight Draco-Equiste", "Gaia Drake, the Universal Force", "Supreme Arcanite Magician", and "Naturia Gaiasteleoh". These six Fusions are the next evolution of Fusion Monsters. The first evolution was the standard Fusion, requiring two regular Monsters, such as with "Flame Swordsman". The second evolution of Fusions Monsters require at least one other Fusion Monster, such as "Dragon Master Knight". The third evolution requires at least 1 Synchro Monster such as "Gaia Drake, the Universal Force". As of Duelist Alliance, it was announced that Fusion, Synchro, Xyz, and Ritual Monsters would be getting an equal amount of support, and since then, Fusion Monsters have been plentiful in core booster sets, sometimes even outnumbering the other two Extra Deck types. 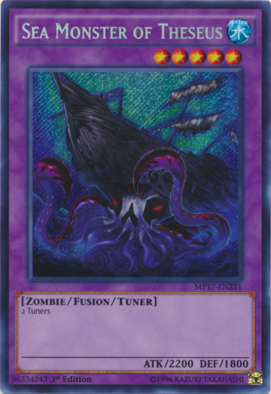 The first Fusion Tuner, "Sea Monster of Theseus", was introduced in the TCG version of Raging Tempest. The first Fusion Pendulum Monster, "Supreme King Z-ARC", was introduced in Maximum Crisis. 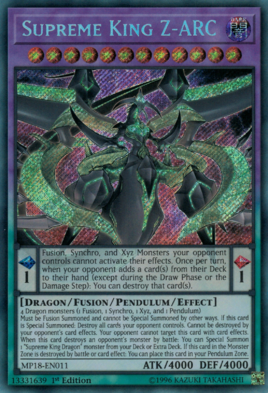 Compared to Synchro, Xyz, and Link, Fusion's main weakness is the need of the "Polymerization" card, meaning that the player's ability to Fusion Summon is usually limited by the number of "Polymerization" they have and on having the card in their hand or on the field. Additionally most Fusion Monsters list specific monsters as Fusion Materials, meaning they are less flexible in which monsters can be used to Fusion Summon. Due to needing "Polymerization" in addition to at least two materials (Transformation Summoning notwithstanding), Fusion Summoning will usually cost the player a large number of cards in hand and field. A key advantage Fusion Summoning has over Synchro, Xyz, and Link Summoning is that effects that Fusion Summon can often use monsters from locations other than the player's field as material, such as the hand or Graveyard, thus removing the need to spend resources Summoning those materials. Many Fusion Summon-focused archetypes have their own "Polymerization" or "Fusion" card, which can often be more easily be searched or recycled in those Decks, allowing the player to reuse them multiple times and perform more Fusion Summons. 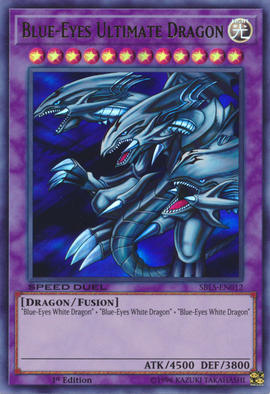 In the original and R manga, the Fusion Material Monsters must exist on the field to be fused with "Polymerization", and once they are fused, they are still treated as separate cards for the purpose of specific card effects (most famously, "The Wicked Eraser", which treated the 3-Material "Arcana Knight Joker" as 3 cards and gained 3000 ATK). In addition, they can also be treated as a number of Tributes equal to this total; as demonstrated in Yu-Gi-Oh! R, less than the total can be Tributed (Seto Kaiba Tributed the "Material Bat" and "Material Scorpion" portions of his "Mosaic Manticore" while leaving "Material Lion" on the field). 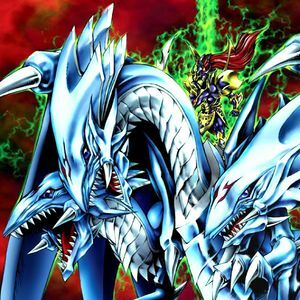 However, the Fusion Materials can also be Summoned while the Fusion Monster is on the field, demonstrated in R when Yako Tenma Summoned 3 "Blue-Eyes White Dragons" with "Junk Dealer" while Seto Kaiba had his "Blue-Eyes Ultimate Dragon" on the field. They are treated as having a Level equal to the highest Level of the Fusion Material Monsters ("Mosaic Manticore", made up of of the Level 4 "Material Lion", "Material Bat" and "Material Scorpion" was treated as Level 4, while "Beast Machine King Barbaros Ür", composed of the Level 4 "Machine Lord Ür" and the Level 8 "Beast King Barbaros" was treated as a Level 8 monster). Fusion Monsters are also treated as having the same name as their Fusion Materials, as seen when Dark Marik is able to target "Immortal God Slime" with "Jam Defender". Under the "Super-Expert Rules", Fusion Monsters cannot attack during the turn they are Summoned (a condition carried over to the Duelist Kingdom and Battle City Rules in the anime). However, Fusion Monsters that were Fusion Summoned without "Polymerization", like "Valkyrion the Magna Warrior", "XYZ-Dragon Cannon", and "Mosaic Manticore", are not subject to this condition. In the GX manga and all subsequent manga, Fusion Monsters were treated like they are in the TCG/OCG. In the anime, the Millennium Scale was the item which originally fused monsters. In the early Yu-Gi-Oh! anime, Fusion Monsters had low ATK and DEF and very few had effects. In Yu-Gi-Oh GX, many powerful Fusion Monsters were introduced. In Yu-Gi-Oh 5D's and Yu-Gi-Oh! ZEXAL, Synchro Monsters and Xyz Monsters, respectively, mostly overtook this role, although Fusion Monsters do still appear. In Yu-Gi-Oh! ARC-V, Fusion Monsters are primarily used by characters from the Standard and Fusion Dimensions. Fusion Monsters reappear in the second season of Yu-Gi-Oh! VRAINS, supporting their users' Link Monster-focused Decks. Fusion Monsters are the only kind of Extra Deck monster to have appeared in all six of Yu-Gi-Oh!, GX, 5D's, ZEXAL, ARC-V, and VRAINS. Like Yu-Gi-Oh!, Fusion Monsters in Yu-Gi-Oh! BAM have purple-colored background. But unlike the real TCG, Fusion Monsters can be played independently, or can be overlayed with an existing monster to produce a new Monster hidden within that Card. Fusing 2 monsters together will trigger an effect aside from creating a new Monster (i.e. : Gaining Life Points, Inflicting Damage, etc.). When the Fusion Monster produced is destroyed, the two materials used for Fusion are also destroyed. "Hex-Sealed Fusion" monsters can Special Summon a Fusion Monster by Tributing themselves and the other listed Fusion Materials. "Summoner of Illusions" can Tribute another monster when flipped face-up to Special Summon a Fusion Monster from the Extra Deck. "Cyber-Stein" can Special Summon a Fusion Monster from the Extra Deck by paying 5000 LP. "Magical Scientist" can Special Summon a Level 6 or lower Fusion Monster from the Extra Deck by paying 1000 LP. 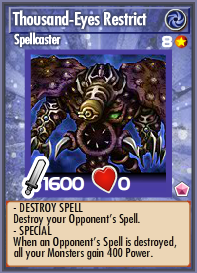 "Metamorphosis" can Special Summon a Fusion Monster from the Extra Deck by Tributing a monster with the same Level. "Temple of the Kings" can Special Summon a Fusion Monster from the Extra Deck by sending itself and a "Mystical Beast of Serket" to the Graveyard. "Dragon Master Knight" and "Five-Headed Dragon" are tied with the highest ATK of all Fusion Monsters, with 5000 ATK each. "Dragon Master Knight", "Five-Headed Dragon" and "Super Vehicroid - Mobile Base" are tied with the highest DEF of all Fusion Monsters, with 5000 DEF each. Yuma Tsukumo is the only protagonist who has never used a Fusion Monster. 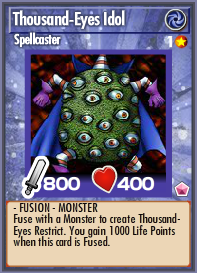 "Thousand-Eyes Restrict" was the first Effect Fusion Monster. It was also the first Fusion Monster to be Forbidden. The illegal card "Yasushi the Skull Knight" is the only Fusion Monster to list a Trap Card as a Fusion Material. It is the only Fusion Monster with a Flavor text. It is also the only illegal Fusion Monster in OCG (there are no illegal Fusion Monsters in TCG). ↑ The parentheses here specify what part is not shown on the cards' Type/Ability line. This page was last edited on 20 October 2018, at 21:52.